The Crometta E EcoSmart Showerpipe 240 Thermostatic Shower Mixer combines a hand and overhead shower, as well as a thermostat, into one product. This EcoSmart model reduces water consumption by up to 60%, as well as energy consumption. 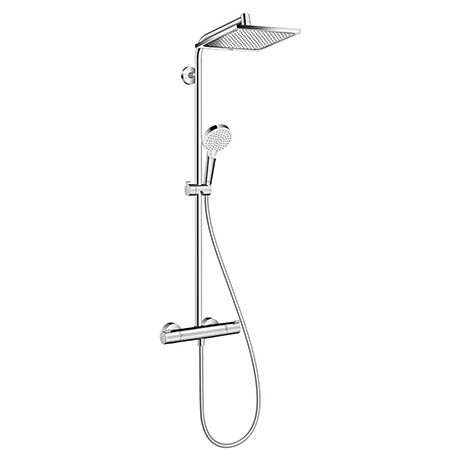 It features a large 240mm shower head and shower handset with a height-adjustable shower holder that can also be turned and tilted. The self-locking slider can be operated with one hand. It's Rain spray is perfect for rinsing shampoo out of your hair while the QuickClean rub clean nubs loosens any limescale deposits making sure your hand shower looks beautiful, and stays working for longer.